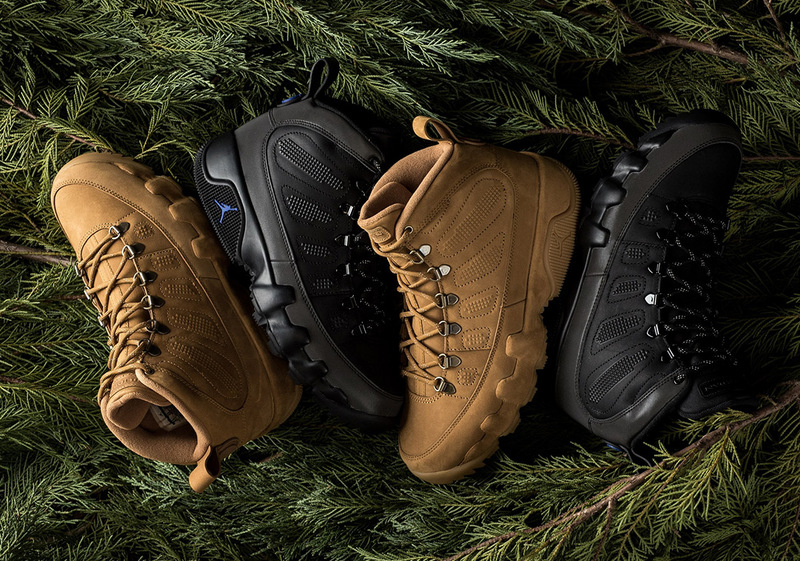 This fall season, Jordan Brand will be releasing multiple renditions of the Air Jordan 9 NRG Boot. Designed as a souped up, more durable version of MJ’s ninth signature silhouette, it is meant to give consumers the ability to formidably traverse through snow and rain without sacrificing style. This weekend, Jumpman loyalists will have two options as far as the AJ 9 boot is concerned – one Wheat and the other Black/Royal. D-ring lacelets, a rugged traction pattern, and spotted trail laces give off a clear boot aesthetic while its midfoot panelling, stamped heel, and segmented sole keep it rooted to the Jumpman’s legacy. Energy surrounding these boots is palpably high, due in large part to the success of last year’s models and the need for attractive and functional footwear. Grab another detailed look at both Jordan 9 NRG Boots below and refer back to this post up until release day as we will continue updating our where to buy links you see below.